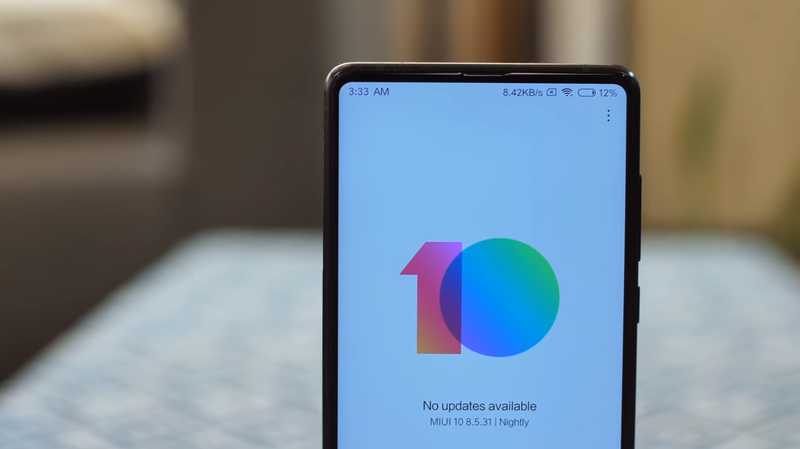 This Guide is also applicable in porting other ROMs like Color OS, Flyme OS, Sense and more... and this guide has been updated for MIUI 10 as well. ROM porting is not an easy task for a newbie and porting a highly customizable ROM like MIUI is a way tougher. When I was porting MIUI v7 Lollipop for a Qualcomm Snapdragon device I did not find a definitive guide for porting the latest MIUI versions. So, porting MIUI became a very tough task since I was a newbie in porting ROMs. I learnt porting through experience. Then I also ported MIUI 8, MIUI 9 and MIUI 10. Hence I am writing this guide to help the new MIUI porters so that they don’t face the problems which I faced. DISCLAIMER: This guide is written to help the emerging devs. Soft bricking is common in porting ROMs. But, I am not responsible if you somehow hard-brick your device. Do it at your own risk. This guide will teach you to port ROMs from devices with similar hardware specs and same Qualcomm Snapdragon chipset. The Port ROM and the Base ROM should have the same android version. ROMs containing DAT files should be properly unpacked. For base ROM you can easily do it by flashing the ROM and taking the TWRP backup of ‘system’ and extracting the resultant file with Winrar/7zip. For Port ROM follow this guide: [DEV] Lollipop/Marshmallow DAT files or you can use SuperR's Kitchen for the same. The size of the system folder of your Port ROM should be lesser than that of the system partition of your device, else you'll not be able to flash the ROM. To decrease the size you need to deodex your ROM and you may further need to debloat you Port ROM which is discussed later. Make sure you have plenty of hard-disk space in your PC. 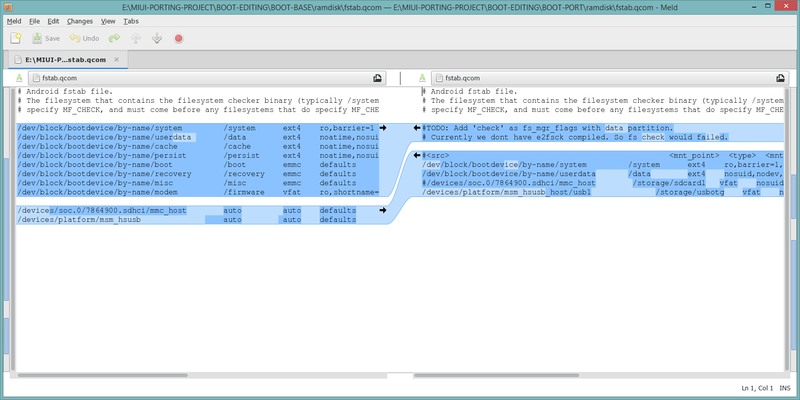 Now place the extracted deodexed Port ROM (i.e. MIUI v7) in PORT folder and Base ROM (i.e. CM 12.0) in BASE folder. Similarly place the MIUI boot.img in BOOT-PORT folder and CM12(or LOS 13/14/15/16 as per requirement) boot.img in BOOT-BASE folder. These steps are required to properly organize the project and will be helpful in our later discussions. Just delete some unwanted files (like .mbn files) and keep only ‘META-INF’ folder, ‘data’ folder (if available), ‘system’ folder, ‘boot.img’ file and ‘file_contexts’ file (if available) in PORT folder. Now let’s do some work to make the Port ROM boot. Open the updater-script file in PORT/META-INF/com/google/android/ with Notepad++. Delete the first line containing “get_device_compatible(….” or “assert(getprop….” which restricts the flashing process to other devices. Then delete the lines containing scripts for flashing radio image, modem image etc. which are not required for our base device. 1. Use Android Image Kitchen to unpack the base and port boot.img in BOOT-BASE and BOOT-PORT folder. 2. Replace the files boot.img-zImage, boot.img-dtb in BOOT-PORT/split_img/ with that of BOOT-BASE/split_img. After this repack your boot.img and place it in your port ROM folder (i.e. PORT) and create a flashable zip. You will be able to boot this time. But, you may face sensors, sound, camera, ext sd-card etc. issues. So let us move on to fix those issues through boot.img first. 5. After sd-card, let’s move towards fixing camera, led, sensors etc. issues. For that we need to edit the init.rc and init.target.rc files. Compare the port ueventd.qcom.rc in BOOT-PORT/ramdisk folder with that of base and add the missing lines to the port. This will fix your sensors issue. 7. Similarly compare other BOOT-PORT files like uneventd.rc, file_contexts etc. with that of BOOT-BASE and use your brain to replace required lines. 8. To fix other issues use your common sense. 9. If you are doing boot.img editing at the beginning of your project, then some of you may find that even after doing all these steps, sensors, led, camera etc. are not working. But don’t lose heart, for that you have to start your ROM Porting. Before starting ROM porting, your base and port ROM should have all the files in place. If you have correctly edited the boot.img then the following steps will help you to solve your bugs. 1. Debloating Port ROM: Just delete unwanted apps or bloatwares from your port ROM. You will find them in /data/, /system/app/ and /system/priv-app/ folders. 2. According to my previous instructions you should have placed your port ROM to PORT folder and base ROM to BASE folder. 3. Adding missing files and folders: You may add missing files from BASE/system/bin/ to PORT/system/bin/. For this you can just copy all the files from BASE/system/bin/ to your PORT/system/bin/ without replacing any file. Similarly you can do the same process in system/xbin/, system/fonts/, system/etc/, system/usr/ etc. and their sub-folders. But always use your brain to decide which files you should add and which you should not. 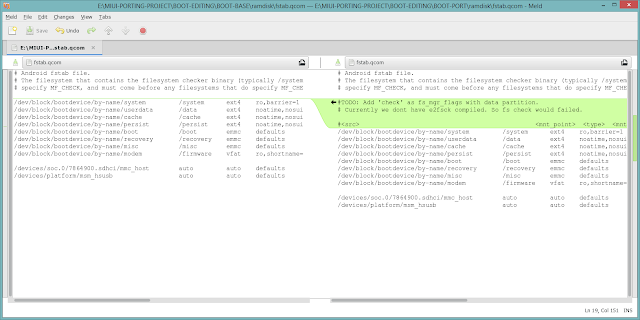 You may also add some missing folders from your base ROM to your port ROM, e.g. system/tts folder, system/etc/init.d if you think it's needed. 4. Fixing permission related issues: Now you have to work on system/etc/permissions folder. Just compare handheld_core_hardware.xml and platform.xml of port ROM with that of base and add or replace some lines if required. You can do the same for some other permission files if required, but as I am always saying use your common sense. 5. Replacing files: Copy and replace files in system/etc/firmware and in system/etc/wifi from base to port. Copy and replace the files goodix.kl (name can be different for different devices), gpio-keys.kl, Generic.kl in system/usr/keylayout/ from base to port. We will discuss more about replacing files in bug-fixing section. 6. Open system/framework/framework-res.apk of both base and port with Winrar in two different windows but don’t extract. Then navigate to framework-res.apk/res/xml/ of base and copy storage_list.xml and power_profile (optional) and paste to the Winrar window of port framework-res.apk/res/xml/ and replace the existing files. Then close the Winrar window. Now let’s move on to our bug-fixing section. If you have properly edited the boot.img then only these fixes will help you. Follow the Step 6 in ROM Porting section. WARNING: Do not replace any file unnecessarily, because it may give rise to new bugs in place of solving it. Always be specific! You can edit required parts of build.prop to reflect the brand, model no. etc. according to your preference. You may also add some tweaks and other things to save battery and to add features. Now your Porting Project is ready to be flashed and to be reviewed. Congrats! Last but not least when you successfully port your ROM, always give credits to the Port and Base Rom developers. Also give credits to the people from whom you took help. Always be generous in giving credits because it will not take anything from you, on the other hand it will increase your reputation and strengthen people’s faith in your work. If you are taking help from this guide in your ROM Porting then don't forget to give some credit to me too. You're already a rockstar in YU forums and xda.. Thank you! You should go for Android 5.0 Stock or Base ROM, else you may get bootloops or RIL issues. If you tell me the device for which you are porting the ROM than I can help you in choosing the Base/Stock ROM. Then I think currently MIUI 7 is not possible for your device. You can go for other ROMs like EMUI, Funtouch OS, Nubia ROM etc. which are available in android 5.1.1. Try replacing other audio libs in lib/hw and also check audio profile in system/etc. For camera try replacing camera libs in lib/hw and also check system/bin if you have already replaced camera libs in vendor/lib. You can also try changing the kernel once. i am having issues with my rom i port the phone is showing dead bbattery and turning off by it self how to fix. Try replacing boot.img/ramdisk/sbin/healthd from base. Also try replacing system/lib, lib64/hw/power.default.so and power.qcom.so. If doesn't work try calibrating the battery. Emmm,we are trying to port FlymeOS(5.1.1) from Yu Yureka to the Idol 3 5.5. The rom boots,but there is no signal(RIL is dead? ),wifi doesn't work,etc. We used files from CM12.1. First I will not recommend to use other ported ROMs for your new ports since bugs will be inherited and may cause other problems since system files are highly modified to make compatible with Yureka. And for Wifi issue use the wlan.ko file from your base ROM or you can flash any custom kernel for your device. Hello Nitesh, nice to meet you. I try, like marionette, to port MIUI from MI4I on our Idol3 (6045). But, i allways have a bootloop with stock modded boot.img. I've doing all you mention on your guide, but no success. Can i send you the stock boot.img ? Modify the port boot.img from the files from stock. The Port ROM will not boot with your stock boot.img since bootclasspath is different. Please follow the boot.img editing part carefully. there are cyanogenmod 12.1 available as a base rom ! but im confused about port rom can you help me out ? Currently no compatible MIUI 7 available for sd410. But keep looking for lollipop update on Redmi 2. But currently you can try porting vibe ui from A6000 or Funtouch OS 2.1 from Vivo v1. But the android version of port ROM should match your Android version ie 5.1.1 or use a cm 12.0 base ROM for you device. okay thanks for the reply ! so can i port miui v6 for the motorola moto g3 !? If you find a MIUI 6 Lollipop for Redmi 2 then you can port, which I think is not available. Nice to meet you Nitesh. I have the same question but it seems that Xiaomi is never going to release lollipop update for Redmi2 as the MIUI7 update for Redmi2 is still based on Kitkat. Is there any alternative to port MIUI to Moto g 3rd gen? how difficult is the cross android version porting as I'm not able to find port ROM for the similar device (chipset & resolution etc..) at the same android version ? Cross Android version porting is not possible in my opinion. Miui 7 Lollipop or Marshmallow will soon release for Redmi 2. Till then you can try porting other UI's like Vibe UI, Zen UI etc. etc. You say "2. 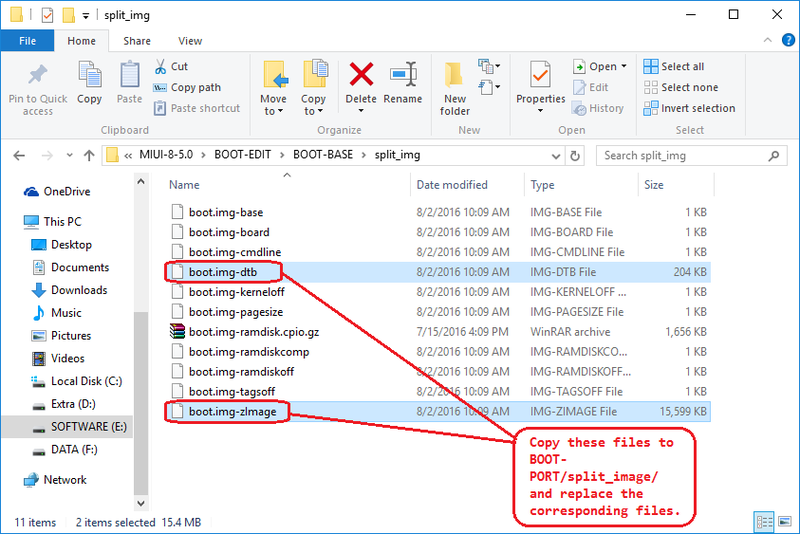 Replace the files boot.img-zImage, boot.img-dtb, boot.img-ramdisk.cpio.gz in BOOT-PORT/split_img/ with that of BOOT-BASE/split_img." But, in the screen shot, it's inverted ! what is good ? Thanks for pointing out. The screenshot has been updated. I want to port your miui rom on my yureka 5.1.1, is it possible to upgrade ? Yes, you can use Miui 7 Android 5.0 on your Yureka Android 5.1.1. For porting Miui 7 choose CM 12.0 as base. If you want to use CM 12.1 as base then choose a port ROM based on Android 5.1.1. Some examples are CoolUI 6.0, Color OS 2.1.0 etc. I tried to port flymeos for yuphoria but it does not booted. PM me all the details of your Port and Base ROM through YU Forums then only I can help you. Qualcomm is cross porting right ? MSM8916 TO MSM8939 Will Work ? No. It should not work. For MIUI 7 you can go for Xiaomi Mi4i ROM (MIUI 7 Global Edition) and for Nubia UI you can choose ZTE Nubia Z9 Mini. You can get Vibeshot Base ROM either from your device or from XDA. And for Nubia UI download you head over here. Can You Make to me Rom ? Sorry cannot work on any project nowadays due to exams. I have ze550kl, zenfone laser 2, 5.0.2, 64 bit msm8916, please suggest port rom. You can go for MIUI 7 from Mi4i, Color OS 2.1 from Oppo R7 Lite/Plus etc. mi4i having msm8939 while my device have msm8916, will porting works ? Oh sorry, I mistook msm8916 for msm8939. You should go for Vibe UI from Lenovo A6000 Plus, Flyme OS from Lenovo A6000 Plus etc. I can port MIUI 7 for my Nubia Z5 from z5s mini or Nexus 4? I have the Stock Rom (4.4) and CM 12.0 and 12.1 for use as Base, which is better to port? You should choose Z5s Mini and use your Stock ROM (4.4) as base. please elaborate 3rd point in boot editing, which values we need to add or delete ? my modified boot image boots but stuck at boot animations. You have to add those lines which are missing, from base to port. You also have to check the lines containing mount points for different things like 'system', 'data' etc. in your port fstab.qcom to match with that of base. If it doesn't match then you have to replace the lines from the base. Screenshots are also given there for better understanding. Which ROM are you trying to port? This guide is full for MIUI ROMs but for other ROMs you have to do some extra things. You can try taking logcat to uderstand the issue. I've done everything he puts in tutorial and not nothing. This is just a basic tutorial written on my experiences. I am trying to improve it as I am getting more and more experienced in ROM porting. Your issue seems to look like a boot.img issue. Check the file contexts, service contexts files in boot.img. Hello, I reviewed the boot.img, but it's all right, you think that it may be because the libs? Maybe. Anything can be the cause. The best way to get an idea about the cause to take a logcat. also your soltion for audio didnt work, any other suggestion? Rename base wlan.ko to qca_cld_wlan.ko and copy it to port. For audio you can try replacing the audio libs in lib/hw/ and lib64/hw/ from base to port. Are there any opportunities on porting MIUI to Galaxy S6 at the moment? Sorry no port device available. Do you know how to convert a 64 bit ROM to 32 bit ? My device doens't have a 64 bit kernel, just 32 bit lollipop (even kernel source is 32 bit). I tried to port Nubia UI 3.0 from ZTE Nubia Z9 Mini, but I got a reboot loop. I then checked and saw that that device comes with a 64 bit kernel, so 64 bit rom too. I think it's not possible to convert a 64 bit ROM to 32 bit. You should go for a 32 bit ROM. I was trying to port MIUI v7 based on MM from Mi4 to OnePlus X using CM13 as a base. When I tried to flash the zip I made, TWRP gives an error which just says error flashing miui.zip. P.S. the error text isn't in red colour which seemed a bit strange. You need to remove useless lines from updater-script as given in the guide. And also the size of MIUI system folder should not be greater than the system partition of your device. For that you can try deodexing the MIUI 7 ROM. I modified the boo.img as told by you. Also the deodexing tool wasn't working so I manually deleted some system apps to reduce /system size of miui to be similar to my base /system. But the problem still persists, it's stuck at the mi logo forever. Also I'm not able to take a logcat,adb refused to detect phone while booting. Could deleting system apps have caused an issue? Could there be a problem in SElinux? Please help. Try deodexing using SuperR's Kitchen to deodex your MIUI ROM since it's based on Marshmallow. And delete only useless gapps like Hangouts, PlusOne, NewsStand, Gmail, Music etc. which can be installed later on. MIUI ROM V7 For Asus Zenfone 2 Laser Ze550kl ? Yeah you can give it a try. It should work. hi nitesh...great guide...trying to port roms for yureka through your method...so first question in a handful of questions to come later, is I unpacked the boot.img but cldnt find split_img..just a folder named boot.img-ramdisk and zImage...so I slh juz replace the zImage right ??? Yes you can just replace the zImage. But which ROM are you porting and which tool are you using? ported china version miui7 of mi4i...while flashing the rom, error - error executing update binary in zip :(...can u help ?? Try changing the update binary file. You can also try removing some unimportant lines from the updater script. Actually I'm trying to port MIUI v7 based on marshmallow from Xiaomi Mi4 to OnePlus X but the ROM is not booting it'sit's stuck on Mi logo forever. Moreover I'm not able to get a logcat and also last_kmsg method is not working in order to know what's wrong.Can you please help? Thanks. If you have deleted any system file then you need to revert it to its original condition. Try to port Global MIUI 7 ROM or sMIUI 7. And deodex it using the latest SuperR's Kitchen. You may delete some unimportant gapps like PlusOne, GMail, GMaps, Chrome, Music2, Hangouts etc. from system/app/ folder to reduce the size. And edit the boot.img as directed. You will need a MIUI 7 Lollipop to be able to port on your device. If your are taking Redmi 2 as port device then you may need to wait since MIUI 7 Lollipop is not yet released for this device. Follow the DAT extraction guide provided under "Common Information" section above. sorry, same result. files are extracted but corrupted. Hi Nitesh, is is possible to port MIUI 7 to Zte Nubia z7 max? Which rom should I use as base? You should use Xiaomi Mi4 MIUI7 as Port and your stock ROM as base. Hi Nitesh, I managed to find the ZTE Nubia Z7 max rom, MIUI 7 but its based on kitkat. (http://en.miui.com/download-259.html) How do I update the same to lollipop? My base rom is 5.1.1 lollipop and the Xiaomi Mi4 rom is also lollipop. Is there a way to update/replace any specific files without now porting the entire rom? I porting also we add/replace some specific files to make the port ROM work. So if you want to use Mi4 Lollipop MIUI ROM then the only way is to port the ROM. You may find already ported MIUI 7 Lollipop ROM for your device on some chinese forums. Hi Nitesh. Is it possible to port Redmi2 Prime's ROM to Wileyfox Swift? In last update they upgraded Redmi2's Android version to 5.1.1. If it possible, can you tell me how can I do? This method didn't work for Wileyfox Swift. Sorry for my bad English. Yes, it can be ported. Just follow the given method. And use the base ROM as directed. Also don't forget to deodex the MIUI 7 ROM. All the best. It will not brick the phone, but it won't boot also. Then first you have to flash the fastboot images of 32bit stock AOSP firmware. Then you may port MIUI 32 bit and it will boot. Hello I have Wifi problem only. Also the Wifi bug-fix has been updated above. Just review once. When I change (lib+lib64) "libhardware_legacy.so" it doesn't boot ROM. Then first try replacing the wifi/wlan/wcnss related binary files in bin folder and also in etc folder. Hello! It's possible now to make a porting to galaxy s6 from xiaomi mi5 rom? But both have different chipsets. Cross-firmware porting is very difficult but you may try once. It will be much easier through MIUI Patchrom. But it has not been released either for lollipop or for marshmallow. The problem may be in boot.img or kernel. Try flashing any custom kernel. If not fixed then take a logcat. I'm planning to port MIUI 7 to a Lenovo Vibe Z2 Pro (K920 CN), I have the stocks roms from KK (4.4.2) and LP (5.0.2) also I have the kernel source from both versions. Which version and which device do you recommend to port (mi note?) I'm concerned about the differences in the camera module and the display resolution. Thanks in advance. You can use your stock ROM (Kitkat) as base and port ROM from Xiaomi Mi Note MIUI 7 Global Stable edition (Kitkat). Camera and display should not matter much, just give it a try. I have a serious doubt. Why is my boot.IMG getting more compressed than actual? Say the port device's kernel is 19 MB, after editing and stuff its coming to 8 MB! How? Is it bad? What is the size of your Port kernel and Base kernel? Seems a issue of mounting. Check your updater script once, especially the lines regarding mounting system, data etc. Also check that the size of extracted ROM should not exceed the size of system partition of your device. Can i port this rom to my Samsung Galaxy A8(A800F) 5.1.1? Yes, if your device has TWRP recovery. can i take yu yunique stock rom as base rom for redmi 2? If you want to port Redmi 2 MIUI ROM for Yunique then take Yunique Stock ROM as base and Redmi 2 MIUI 7 ROM as port. i am working on port flyme os from coolpad f2 to vodafone smart ultra 6,following your post, all work except camera app,it dont apear on app drawer....what can i do?? Maybe your camera app is corrupt. Try any other camera app or use any ported flyme camera app. No bro. I want to port fom for Redmi 2. Can i take yu yunique stock rom as a port rom and cm 12.1 as base rom? And also bro i have very much doubts in porting the rom. How can i contact you personally? For contacting pm me on my YU forums account. I have xiaomi mi4(cancro) and I want to use cynogenmod as base ROM and official miui 7.2 ROM as port ROM which is already made by miui team.Do I need to port the boot.IMG file too? Basically I need a ROM with multi window and doze support.so I thought installing cynogenmod ROM with miui UserinterfaceUseliace(I love iit) present.Plz answer whether I need to port boot.IMG too? Yes, you need to port the boot.img. I'm trying to port Marshmallow MIUI from MI Note or MI3 on my Oppo Find7a (snapdragon801). And for camera follow camera bugfix method above. Can i port touch wiz from samsung j5 to redmi 2 by your method? You can try but I am not sure about it. A radio image which lines, modem image? i port the rom to moto x, but the bootanimation dont load. just load the logo and afther shutdown. why? Edit boot.img correctly and use the tool suggested. When i repack the boot imagen give me two files, new-boot.img and ramdisk.gpio.gz. Why? What i have to do With randisk.gpio.gz? You have to do nothing with ramdisk.gpio.gz.You just have to use the new-boot.img. Hey! I am trying to port this to the LG G4 (international). I am using stock ROM 5.1 lollipop as base and MIUI lollipop 5.1.1 for Xiaomi Mi 4S because it has the same CPU, RAM and GPU. Most probably a boot.img issue. Check fstab.qcom in ramdisk of boot image and edit it correctly as mentioned in the guide. You can also try replacing lib,lib64/libart.so, libart-compiler.so, libart-dissembler.so and libsigchain.so. i have camera and sound issue how to fix it my call works but external sound not working and camera will not start it crashes . If you have already tried replacing the audio libs then replace system/etc/acdbdata/ files and system/etc/mixer-paths.xml. Replace all the libs related to camera in lib, lib64, vendor/lib, vendor/lib64, bin folders. my phone bootloop when i replace libcameraservice.so what to do i only have two bugs in my custom rom now. You may need to wait for ARM 64 upgrade of Redmi 2 or look for any other port device with sd410. This guide is for qualcomm based but I have meditek 6752 and notification light not work.. When lunching cit and test lights it's not blink my device support red and green light how fix this plzz tell me.. Thanks.. Check system/lib/hw and try to find lights. ****.so file. If such file is there replace it with base. thanks for this great tutorial on how to port qualcomm rom. i most concede u rock. plz i need your help.i was able to port coolpad 8675 fhd rom to my tcl m2l but i always come across this same issues, no sound, camera force close and cant play video but i was able to fix the video issue by replacing files from system-etc, system-etc-fameware, system-etc-permission, & system-lib, but cant seem to find a fix for camera and sound. my phone use to bootloop whenever i replace libcamera-client file from system-lib and libaudios lib files from system-lib. what should i do next? You don't need to replace libcamera-client.so. The post have been updated with new bug fixes. Check the bug fixes section. have fix sound bug by replacing all the mixer-path and audio files from system-etc. but theres still camera bug and wifi bug. wifi is optional to me. i can still do witbout wifi but camerA is something i cant do without. Try replacing the camera related files also check the boot.img for anything missed related to camera. Refer to Bug-Fixes section. The Camera fix provided above should work. You must have done some mistake in updater script. Most common mistake is missing ";" at the end of each line. Check for it. Also delete "assert(getprop....." line if you have not already deleted it. Offline charging issue is really a well known bug of MIUI 7 Ports. You can check charging related lines in ramdisk/init.RC or init.qcom.rc. And for 3g data edit the "ro.telephony.default_network" in build.prop according to your base ROM. How to fix camera con not connect with switching camera from front to back. But can i ask u a question? good work you help me alot but i have one issue my divices is sd410 sd mean snap_drogan soc410 i was wondering where i can get roms from to port because the miui7 rom i port is not fixed for offline charging but i want to sometimes turn my phone off while charging. You can try porting ColorOS 3.0 from Oppo A37. As well trying to add option for home button double tap sleep and wakeup.and default app install in sd card. But when trying to decompile system.apk and other syst apks its done with errors...means decompiling incomplete..due to its not compiling again. i am using win7 32bt tryed apk tool advance apk tool and such more but its not working...used basic procedures already. And for decompiling apks you should use Jbart tool (google it) or use the aapt from that tool. And always use latest apktool. It is not a big problem. It actually turns green at 90%, but 1% doesn't matter. But you can try calibrating your battery. And Green LED at 90% is set by MIUI devs so nothing much can be done from our sides. Is it possible to port Samsung note prime KitKat rom to CP8297..same config. Already tried but sim cards are not detecting. Try replacing etc/firmware/ files. This may fix the sim detecting issue. 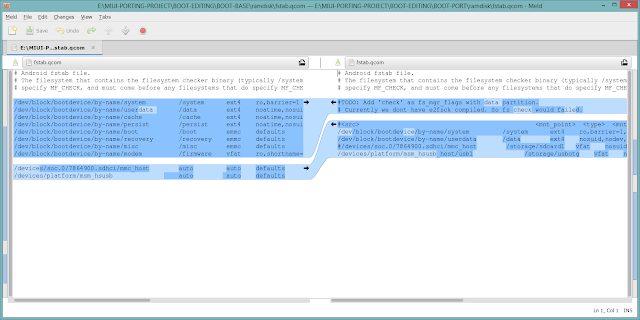 Trying to decompile Settings.apk of MIUI7.3.1.0 global stable rom.and used advanced apktool,Android multitool, the error is-skipping"android"package group-tryed jBART also with latest apktool. Uninstalled java and installed java jdk and used aapt from jBART (with latest apktool)....but not working...same error again.its decompiling but not recompiling. There must be some problem in settings.apk. Try porting xiaomi.eu MIUI ROMs. You are using the correct port device. Just edit the boot.img correctly and replace the etc/firmware/ files with that of base. while charging offline every time screen turn off and on i port the miui7 rom from yuphoria because every rom was 32bit and my kernal supports 64bit. You can get ColorOS 3.0 here: http://www.oppo.com/in/downloads/. And for light sensor try changing kernel or replacing light and sensor libs. how to make the system folder more smaller for color os try to remove some aps but when i flash the rom it got stuck on setup not going to home screen. i use META-INF buti do not thing that is the issue. You must have deleted some core apps. Try to find what you deleted and check by flashing the apps one by one whether it boots or not. Yeah, you can try if they have same chipset. Yeah you can give it a try. You can use Mi4i MIUI 8 as port ROM. And you can use CM 12.0 as base ROM (if you have) or you can try Color OS 2.0 based on Android 5.0 as base. It's required to use SuperR's Android Kitchen which can deodex ROMs and makes ROM porting a lot easier. But it's not compulsory if you are porting an odexed ROM. In the MIUI7beta rom from XDA for CPdazen1....there is a option in settings "Advanced settings" in that option we can install apps direct to SD card...and on great feature also that is doubletapp HOME button to sleep and wakeup device.. I found one app in system/priv-app/stocksettings.apk is used for these all feature. pls suggest how to Add this in my poreted rom. and also i want to remove "child mode"..."Lite mode" from settings. Try replacing the settings.apk with the other one. Or you may try modding settings.apk by decompiling it using apktool. You can find related posts in miui forums. Just search for that. You can try porting it from Redmi 2 which has the same chipset. CM 12 ROMs are already deodexed, you don't need to deodex them. LOL! Hey Nitesh, you have even marked ramdisk.cpio.gz to move from base to port and in the text you haven't mentioned about ramdisk. No need to replace ramdisk.cpio.gz. There's a mistake in the SS. I will correct it asap. Yes you can use the Ramdisk of MIUI but you have to modify it if required. Yes you can use GPE ROM as base. And can HTC sense zImage be used? Can MIUI 8 of mi5 be ported to OnePlus 3? They have Same snapdragon processor 820 but different speeds. Different speeds don't matter, HTC One M8 has MSM8974AB at 2.3 GHz and HTC Butterfly 2 has MSM8974AC at 2.5 GHz and we don't do anything special to port from M8 to B2, just fix camera, NFC, Wi-Fi and create a working boot.img.